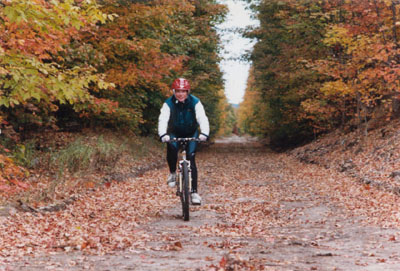 Cycling along the 17-mile portion of the TART (Traverse Area Recreation and Transportation Trails) known as the Leelanau Trail is beautiful and exciting any time of the year. We can’t wait for you and your students to enjoy this community gem. Please consider bookmarking this page as you prepare. You’ll find a checklist to help you get ready as well as supporting documents including the maps, directions, and other important information. As always, if you have any questions, please reach out to our office at 231-271-3077 or isea@schoolship.org. Complete and send your class roster and sizing information sheet to our Program Coordinator to ensure that the proper-sized equipment is available for your program. Please note: if you have opted to do a point-to-point trip you will need to make travel arrangements for your students to be picked up at the end point you’ve selected. 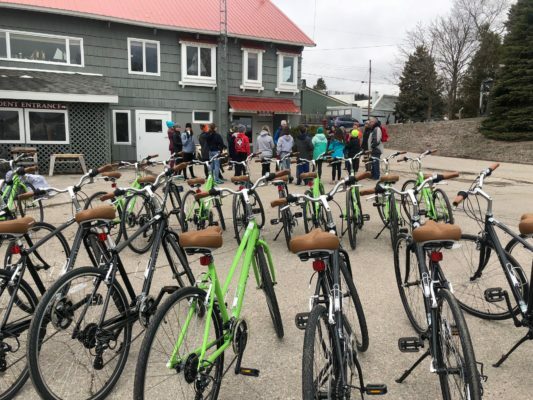 Our staff will pick up bikes and helmets only. Consider adding a stop at Leo Creek Preserve to your trip. Whether you stop for lunch in the garden, a short hike, or a guided soil science program, your students will enjoy the beauty of this preserve. Contact us at least two weeks prior to your trip to add a soil science or stream sampling component to your visit. Share location and parking information for starting and ending location you have selected with your drivers. Be clear to students that weatherproof clothing is needed. Be clear to students that closed-toe shoes are required. Flip-flops are not permitted. Students should each have a water bottle with them. There are standard-sized water bottle holders on each bike. Plan to arrive a few minutes early if you’d like students to use the restrooms on-site prior to departure. Share your trip photos with us! We’d love to see the fun you had!